Be the first to share your favorite memory, photo or story of Jared . This memorial page is dedicated for family, friends and future generations to celebrate the life of their loved one. 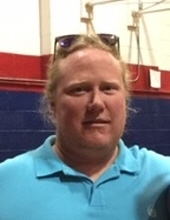 Jared Darnell Hearndon, 32, passed away on Thursday, January 24, 2019 at his residence. He was born April 17, 1986. He never met a stranger and his empathy for others always shined through his warm and endearing smile. Making friends was instantaneous and he was a great friend to many. He loved spending time with his children, Alabama football, and grilling with his dad for family and friends. He also enjoyed spending time on the water. Jared was preceded in death by his grandparents, Harold and Belle Kirkwood, Julian Hearndon, and Juanita Rowell; beloved aunt, Phyllis Thompson; and uncle, James Ira Hearndon. He is survived by his parents, Darnell and Greta Hearndon; wife, Eryka Hearndon; children, Gabriel, AnnaLeigh, Sophia, and Jared Jr.; siblings, Darcy Johnson and Mandy Hautamaki; along with numerous nieces, nephews, aunts, uncles, and other relatives and friends. Visitation will be held on Sunday, January 27, 2019 from 12:30 p.m. until 3 p.m. at Heritage Funeral Home in Moss Point/Escatawpa, MS. Funeral service will begin at 3 p.m. in the funeral home chapel with Brother John M. Egbert officiating. Interment will immediately follow at Johnson Cemetery in Wade, MS. Pallbearers will be Brian Hearndon, Kyle Hearndon, Aaron Bullock, J. R. Haynes, Dallas Brooks, and Gerald Bailey. Heritage Funeral Home, locally owned and operated in Moss Point, MS, is in charge of arrangements. To send flowers or a remembrance gift to the family of Jared Darnell Hearndon, please visit our Tribute Store. "Email Address" would like to share the life celebration of Jared Darnell Hearndon. Click on the "link" to go to share a favorite memory or leave a condolence message for the family.